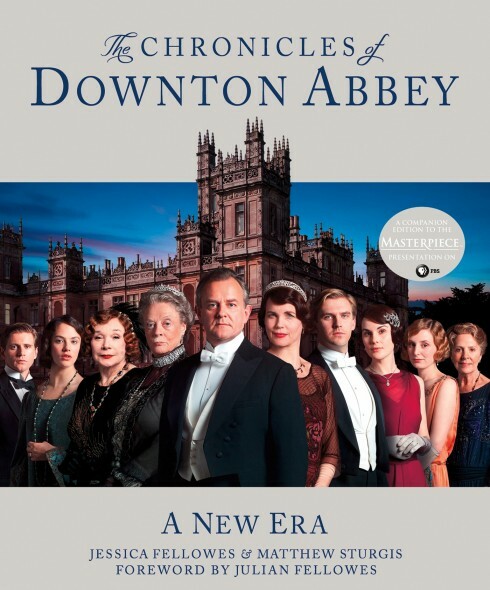 Today marks the US release of the second companion book to Downton Abbey, The Chronicles of Downton Abbey, and I have Jessica Fellowes here once again for an exclusive interview about the book and upcoming third season! You can read the interview I conducted last year, for the release of The World of Downton Abbey, here. We are almost exactly one year after the publication of The World of Downton Abbey: how thrilling has the response been to the first companion book, and did you ever expect to pen another? The response to the first book was absolutely amazing. I saw my name at the top of the UK Sunday Times bestseller list (yes, I have it framed and hanging in my bathroom!) and in the New York Times bestseller list, and that’s not something I had ever dared hope for. But even better than that were the hundreds of positive comments online from readers, as well as emails and tweets that were sent to me by people who had enjoyed reading it. The best thing for me was that readers liked the rich photography and the behind-the-scenes details but they had also been pleasantly surprised to find that they were learning by stealth, taking in the history of the period and so understanding even better the attention to detail that the production achieves. In other words, I think the book enriched the viewing and that was what I really had hoped for. I was actually very surprised when the publishers said they not only wanted a second book but wanted one with as much text as the first! But I was, of course, delighted to be asked. Compare and contrast the process of creating The Chronicles of Downton Abbey versus The World of Downton Abbey? Did you feel more confident this time around? We made the decision that this book would be even more personal – both in terms of my own voice and take on the show, and also in terms of it being much more led by the characters. We also brought in a brilliant researcher, Matthew Sturgis, who was able to bring a fresh eye to the material, which helped. It was great for me, as it meant I more or less sat in my corner at home and after a good read around was able to just get on with the writing. I did feel more confident, yes, just because I feel that much more knowledgeable about the period, also because I know the characters so well and because I felt that readers had told me that I managed to do a good job before. But it’s still nail-biting when you hand the manuscript in and wait to hear back from your editor! What are some things readers should expect from the second companion title to the series? It’s much more character focused than the first book, so each person is analysed in three different ways: their own storyline and how that has developed across the series; how the production (costume and so on) contributed to making their character come alive, as well as what the actors think of their own characters; their historical counterparts and what their cultural reference points might have been – the books they might have read, movies they might have seen, newspaper stories that might have inspired them. Downton Abbey has made an even greater cultural impact in 2012 than in 2011—what predictions and speculations do you have about the future (i.e. period dramas, books, clothing, etc)? Now that ‘Dowager gems’ has become a Twitter hashtag, it’s hard to know how much further it can go! The republishing of previously forgotten books from or about the period, has been a joy to me. Some of the clothes are obviously rather wonderful to see, although I hope the comeback fashion doesn’t extend to corsets. Nor would we want our dentists or doctors to go down any kind of retro road! But perhaps it’s possible that a reflection on what the previous generations struggled to achieve that we might reap the benefits today – women’s vote, equality of opportunity – will revive a social conscience and political interest that would be a good thing to see. Now that the denizens of Downton Abbey have moved into the 1920s, what is their outlook on their post-WWI society? What differences or similarities will we see eight years after our first meeting with Crawleys and their servants? What’s interesting about that time is that there was a real divide between the generations. The older ones tended to want to get back to the way the world was before the War. But the younger generations seized the opportunity for change with alacrity. War had turned everything upside down, as well as escalated change – social, scientific – and they could see that if they didn’t make the most of it immediately, it might fade away. The hardest time was had by the men and women who had fought on the frontline or worked in hospitals witnessing gruesome injuries: no one wanted to hear their story. I was very struck by the lack of sympathy shown to former soldiers, when one might have expected the opposite of what we think of as a gentler time in history. But people were keen to either get back to business or celebrate a life they now knew to be short and not always glorious. Name some of the amazing sources you uncovered whilst writing The Chronicles of Downton Abbey! I’d recommend to anyone interested in that time to try and read the newspapers – they give such a good sense of what people were interested in, what they were buying (always look at the ads, too!) and who the personalities of the day were. That was my best tip, received from Juliet Nicolson (‘The Perfect Summer‘, ‘The Great Silence‘). For Chronicles, I drew a lot from Grace and Favour, the memoirs of the Duchess of Westminster, Loelia Ponsonby. Lots of wonderful detail about the time – she was great friends with the Bright Young People, particularly the instigators of the Treasure Hunts and the Bottle Parties. A great read! Ha haa. Of course not. But I can say that you won’t be disappointed – it’s the best yet. Purchase the US edition on Amazon, visit Jessica’s official website, the Macmillan website, or follow her on Twitter! The UK edition, which went on sale Sept 13, may also be purchased on Amazon. Look for the official scripts for S1 and S2 early next year! Look at the cast portrait – Branson & Matthew are there, but Edith is still alone. One of the sisters is doomed. @NJ: I have high hopes for Edith this season! Just bought my copy yesterday thanks to a B&N gift card I received for my birthday. @Elizabeth: Gotta love gift cards! Do let me know what you think of the book.